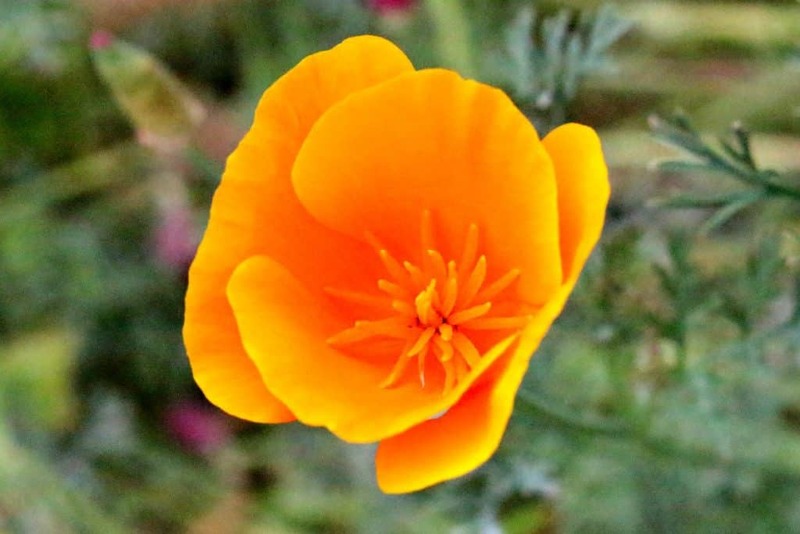 I came up with the idea for how to make this golden poppy craft while photographing them in my backyard. Now I can enjoy them year round! 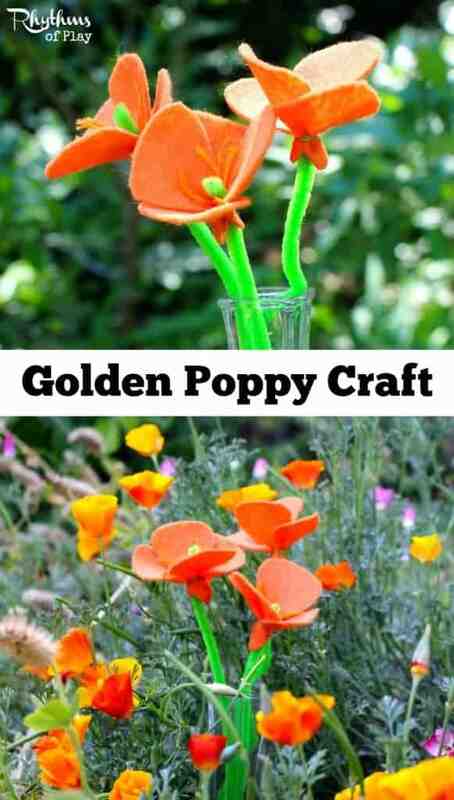 This golden poppy craft can be made in many colors for many different purposes. They would make a lovely centerpiece or gift for Mother’s Day, weddings, showers, and birthday’s. They would also be perfect for displaying on nature tables, and would be a great addition to a botany unit! I free-hand cut each petal. You can also cut out several triangles the same size and then round all the corners. If you are making these with your kids use a ruler to draw triangles on the felt all the same size. Have your kid(s) cut them out and round each corner. Cut 5 – 10, 2 – 3″ sections of darning thread for each poppy. The stamen will be the top of the pipe cleaner. 4 Petals, 1 pipe cleaner, 1 loom band, and 5-10, 2-3 inch sections of darning thread. This is to be able to work on several flowers at once if you havekids and/or friends helping you. Use glue gun to place a drop of glue in between petals towards the bottom. Wrap the loom bands as many times as you need to make it nice and tight. Gently open petals to bring loom band into position. Be careful not to pull petals out. The loom band should sit approximately 1/4 inch above the bottom of each petal. 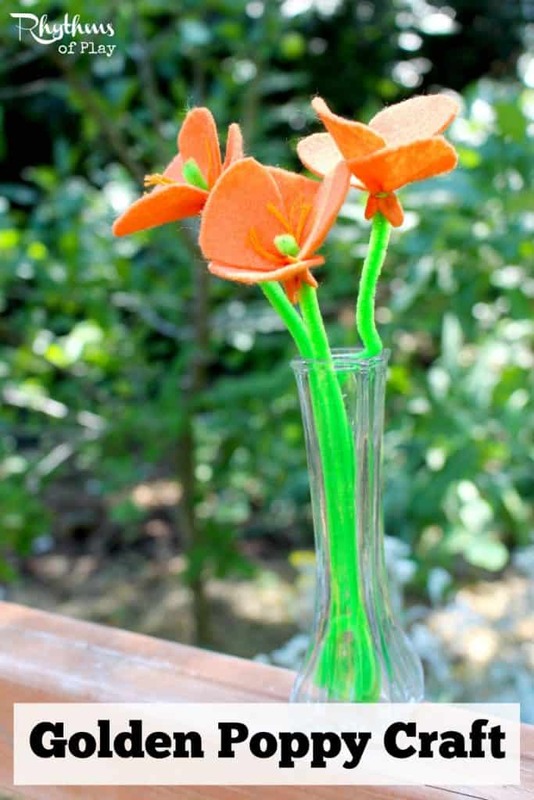 Step 12 – Place in small vase and enjoy! This post is a part of the Tour the World by Flower Blog Hop. Click on the link to see the other flowers made by participating bloggers.